The Schlemmer Group sponsors the five-member motorcycle rallye team of Red Bull KTM Factory Racing since 2017. 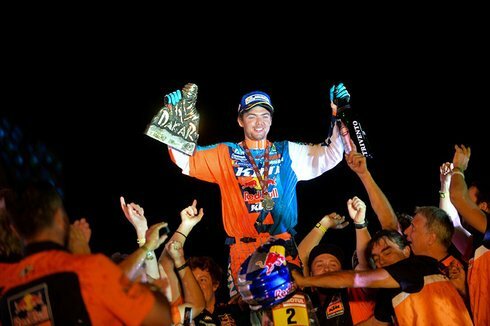 The first year of this cooperation has been highly successful: At the beginning of the year, KTM driver Sam Sunderland from Great Britain became the overall winner of the motorcycle ranking of the 2017 Dakar Rallye. His Austrian teammate Matthias Walkner came in second, thus making the one-two victory perfect. Walkner won the OiLibya Morocco Rallye 2017 in October. With these rankings, they entered the top five riders in the world championship ranking. The extraordinary success story continues this year with the support of the Schlemmer Group. "We look forward to continuing our collaboration with the Red Bull KTM Factory Racing Team in 2018. The Dakar Rallye will be the next challenge in January and we are confident that we will be able to build on our previous successes," said Josef Minster, CEO of the Schlemmer Group as the extension of the sponsorship was made public. The experience from this ultimate endurance test will continue to flow into the successful development cooperation between Schlemmer and the manufacturer KTM to also establish our innovative cable protection components in motorcycle racing. The Dakar Rallye is the ultimate test of man and machine: mountainous sand dunes. Extreme altitude. Unpredictable weather. Punishing distances. The 2018 Dakar route was set to be the toughest ever. At the Dakar Rallye, the world's best motorcyclists are once again competing for victory under extreme conditions in the world's most famous off-road race. The rallye, which has been held in South America since 2009, will cover almost 9,000 kilometres in 2018 through three countries: Peru, Bolivia and Argentina. Each country will offer competitors dramatically different terrain – from the sand dunes of Peru, over the mountains of Bolivia to the fast tracks and riverbeds in the heat of Argentina. The Dakar Rallye started on January 6th 2018 in Peru's capital Lima and ended on January 20th in Córdoba in Argentina.